The real 2014 NBA MVP award is only going to one of two players, and it’ll either be LeBron James or Kevin Durant. Some of that falls on the argument over what a “most valuable” player is — the best player? The winningest player? The most stylishly skilled? The one that sells the most jerseys to the most markets? But the majority of it is fueled by the threat of the backlash that would erupt around the fandom if either LBJ or KD weren’t elected for the award. So, that’s that. It’s the same reason why the league shifted the All-Star voting to a fan vote in 2003. The majority must be sated. That’s cool — the fandom isn’t often wrong, at least not when it pertains to which players should be part of the All-Star festivities and such. Sure, it offers a heavy benefit to players who are in larger markets, or players who appeal more strongly to a specific segment of fan, but those guys have more fans, so they get more votes, so they get into the All-Star Game. There’s no way Kobe Bryant, who spent much of 2013 physically unable to play basketball, should’ve been a legitimate ballot choice. Basketball ain’t about votes, anyway. It’s about buckets and awesome. In fact, the dictionary definition of basketball, courtesy of the OED, describes it as a “container, usually a bucket, filled with awesome.” So, in that spirit, here are five NBA players that brought the awesome — even when they were in the middle of nowhere on Late Night League Pass. The Minnesota Timberwolves are not a good basketball team. They are probably not as bad as they appear to be — even if you’re bullish on Kevin Love’s abilities, and there are a couple ‘fair enough’ arguments for that — but they’re not super great. They do play in an uptempo, entertaining offense, courtesy of head coach Rick Adelman, and that kind of offense allows Corey Brewer to do his thing. Corey Brewer plays basketball like a 16-year-old with a learner’s permit on the road: to the fearful consternation of everyone in his vicinity. 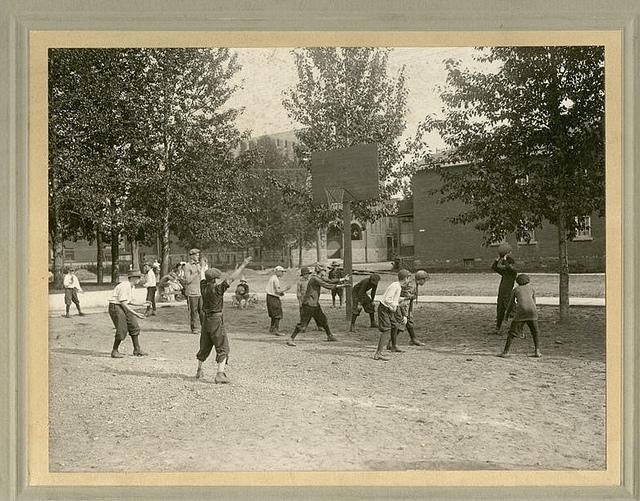 He does not play hoops in any way that looks safe, parent-approved, or in control. It’s the best. Brewer (who is averaging just under 12 points, 3 rebounds, and 2 assists a game in 32 minutes) is a non-entity until you hit transition. Then, when he takes off with the speed of a roadrunner and the apparent limb coordination of a baby giraffe, he becomes an entity unique among the NBA landscape. 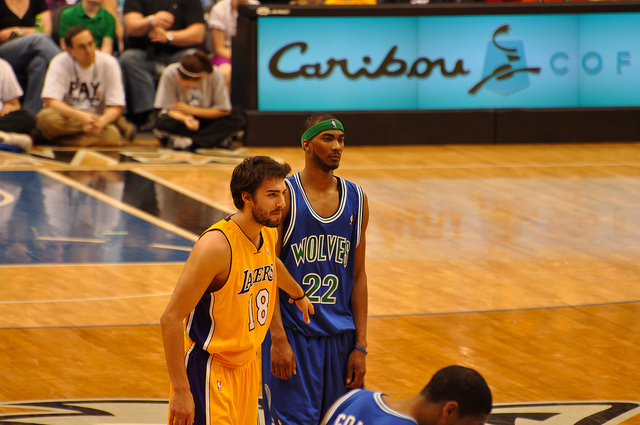 With the amount of time the Timberwolves spend looking to get out and run, each game is going to feature at least one Corey Brewer sighting. Like watching a mythical beast descend from the heavens and then trip on a pebble. When your team is making NBA Jam-style tribute videos to your single-game performances, but you might not make the playoffs and there’s no way you’re getting anywhere near the All-Star Game (but you’ll definitely be in the dunk contest), you might be Gerald Green, one of the most well-traveled basketball players in the league today. Green, who is putting together a nice season out in the deserts of Arizona, is averaging 15 points per game on almost 40 percent shooting from three-point land. That’s almost elite from distance, and a far cry from the uber-athletic prospect who was drafted by the Boston Celtics fresh out of high school all the way back in 2005. Since landing with the Celtics, Green has gone to Minnesota, Houston, Dallas, then outside the NBA to Russia, Los Angeles, Russia again, China, New Jersey, Indiana, and finally back to Phoenix. Now, at the ripe old age of 26, the wing player seems to have finally gotten it — whatever ‘it’ is — and the Suns are fighting for one of the final playoff spots in the highly competitive Western Conference. Since 2005, Green has played in only 272 NBA games, a culmination of not ready, not expected, and not signed to a team. That is sad, because Gerald Green can make an awful game well worth watching. Find time and watch the Phoenix Suns. It’s worth staying up late for. One half of the Lopez siblings in the NBA, Robin is the defensive anchor for a Portland Trail Blazer squad that’s looking to get back into the playoffs for the first time since 2011. 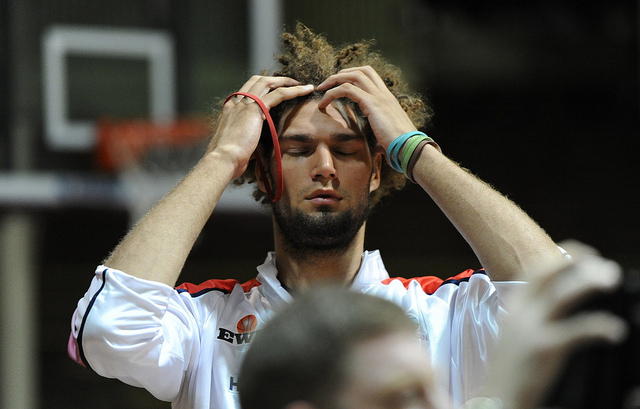 But that’s not why you pay attention to RoLo, as the team calls him. No, that is not the reason at all. Lopez — along with fellow center Joakim Noah — has a style and an athletic aesthetic that seems worlds removed from the smoother-than-silk that comes to mind when the phrase “basketball” is uttered. No, Shaggy ‘Pez — who, along with the rest of the starting 5, was recently honored with a super rad drinking glass by the Blazers – is always moving sort of like a locomotive engine prototype, grabbing boards and defending the paint in such a way that, were he a video game character, you would say it looks like he should have one more animation frame. Also, he’s a great teammate with an emphatic sideline presence, so emphatic that his Trail Blazer teammates take time out of their film sessions to enjoy it. 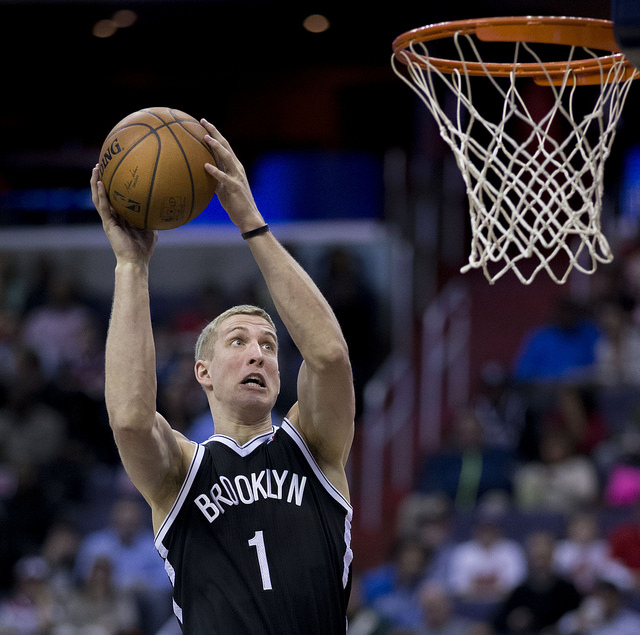 Mason Plumlee, middle scion to the NBA-ready genes of the Plumlee clan, could probably be the Rookie of the Year. (Mason and his brother, Miles, are both in the NBA, while younger sibling Marshall is still playing hoops at Duke University where each of them went to school.) This is not a particularly controversial statement unless you haven’t been paying attention to Mason Plumlee, in which case you’re probably wondering how on earth he could be considered a choice over Orlando’s Victor Oladipo or Philly’s Michael Carter Williams. Per the excellent NetsDaily, “Mason Plumlee leads NBA rookies in shooting percentage, player efficiency rating, and dunks,” and he’s helped the Nets to a 14-5 record since replacing the injured Kevin Garnett in the starting line-up. As that blog notes, he’s contributing to a team that’s definitely going to make the playoffs, something that can’t be said for MCW or Oladipo. Furthermore, he’s willing to go out and do what he needs to help his team win. That counts for a lot when you’re an unsung All-Star. Also, you know, he’s not a bad player. At all. Check out this highlight reel, it’s full of good basketball (and dunks.) Then watch him try to approach strangers for their autographs, because that’s just fun. Isaiah Thomas is such an unsung All-Star that he gets boo’d at Madison Square Garden for having a name that’s close, but not identical, to the Hall of Fame player and Hall of Shame executive Isiah Thomas. But IT22 is one of the most entertaining players in the league, a 5’9? score-first pointguard who is the ignition switch to the Sacramento Kings. In that metaphor IT’s teammate DeMarcus Cousins would be both the engine and the emergency break. Thomas, the very last pick in the 2011 NBA draft, has played his way into a starting role with a delicious blend of panache, style, and, until recently, front office incompetence. The Kings, who under the Maloof Brothers’s ownership had trouble meeting the salary floor or keeping their chairs from breaking, drafted Thomas because they had to, basically. Then he came out and played with an industrial sized chip on his shoulder. He is also the shortest player in NBA History to record a triple-double. IT22 is rad.